In the darkest hour of the night, we sit momentarily defeated as we ponder the destruction now taking place in the shining city on a hill. We are exiles. We are creatures of a dark political night which knows nowhere to go but forward. 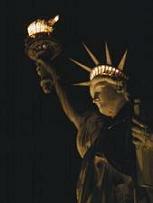 We rely on freedom's light, the lamp of liberty at a time when destructive forces try to dim its shine. The leftists tried to kill that light last night. And although they won this battle, the light still shines on. We hear the clarion call from Alaska and we heed it. We’ve been reminded many times that elections have consequences. Yesterday we saw the consequence of voting for those who believe in “fundamentally transforming” America whether we want it or not. Yesterday they voted. In November, we get to vote. We won’t forget what we saw yesterday. Congress passed a bill while Americans said “no,” and thousands of everyday citizens even surrounded the Capital Building to beg them not to do it. Has there ever been a more obvious exhibition of a detached and imperious government?